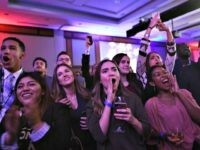 While the Sunday awards show topped NBC offerings with a 2.1/8 rating, it still suffered a 9 percent loss over last year’s showing on ABC. And last year’s show was a ratings loser, too, Deadline reported. The annual music award celebration faced heavy competition on Sunday night with the NBA playoff game on TNT, which earned a 5.8 rating in metered markets as the Warriors trounced the Rockets putting Steph Curry and company ahead 2-1 in the series. Game 3 of the series was up 26 percent over last year’s comparable playoff game. The Voice co-host and pop megastar Kelly Clarkson opened the show bucking the scheduled “moment of silence” and, instead, calling for a “moment of action” and “change” on the issues of guns in America. 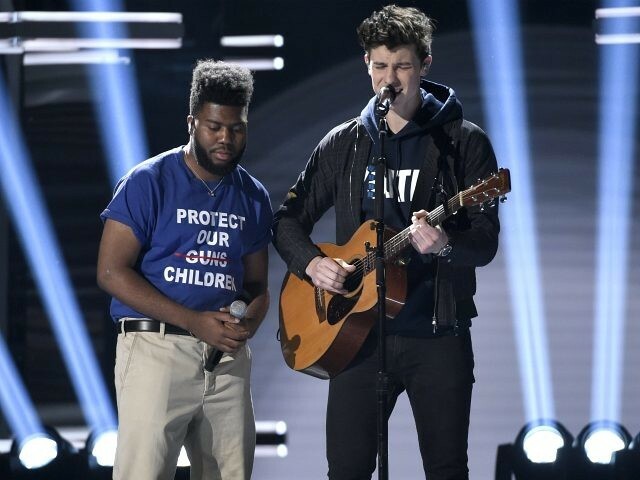 Pop star Shawn Mendes and rapper Khalid were joined onstage by the Marjory Stoneman Douglas Show Choir who belted the song “Youth.” Khalid’s political statement came in the form of a shirt, which read “Protect Our Guns Children” with the word “Guns” crossed out. Still, despite the large viewership for the NBA, most of network TV was in the dumps on Sunday as finales mostly declined in numbers over last year’s offerings. The night’s Fox line up earned an average of .8 while the two-hour season finale of the CBS crime drama NCIS: Los Angeles pulled in a .8/3 rating, giving the season some of the worst numbers the series has seen. CBS’ 10 PM offering, the political drama Madame Secretary, remained flat over last week with a .6/3 rating, though its finale lost over last year’s numbers.